Head over to the RotoExperts.com baseball blog for my article on how to have a great hot stove season. This very valuable step is often missed, especially when your fantasy baseball season ended in frustration. By looking back we can uncover where we went wrong. Did we take too many chances at the draft? Have you become predictable? Was that drunken Fourth of July trade you made with your weasel of a cousin a bad idea? Did you dump CC Sabathia on some “sucker” after his second terrible start in April? Making these self-evaluations, we can stop ourselves from making the same mistakes again. We should also take the time to study our rivals. How did your league champion win? Does he make amazing trades? Did he rebuild for two years? Maybe your rival has a weakness for players on the Boston Red Sox that you can exploit. Does he have what looks like an unbeatable collection of young stars he can keep? Perhaps he exploited a loophole in the rules. We need to know our rivals as well as ourselves. This is not shaping up as a good off-season for my fantasy teams. Matt Holliday (OF, OAK) was a big part of my 13 team NL-only league. Holliday, of course, was dealt to the American League dwelling Oakland Athletics. That same team included Chase Utley (2B, PHI), about to have surgery on his hip. The best-case scenario for Utley seems to be the shaving of a few bone spurs and a rehab process that would keep him inactive for most of Sprint Training. The worst case would involve serious repairs and a prayer for a return in July. In addition, as you have probably guessed, that same NL-only squad features Chad Billingsley (RHP, LAD), who slipped on some ice and broke his fibula on Friday. Billingsley should be ready for the start of Spring Training but my plans to trade him are crumbling. I hope that your off-season is going better than mine is. The Atlanta Braves claimed Eric O'Flaherty (LHP, ATL) off waivers from the Seattle Mariners. O'Flaherty has some potential as a bullpen lefty. He is a groundball specialist who has shown strikeout potential in the minors but has fooled no one in his brief stints in the majors. He will not be in the closer mix so his fantasy value is zero (if not less than that). The Phillies traded their most advanced outfield prospect, Greg Golson (OF, PHI), for John Mayberry Jr. (OF, TEX), the Rangers power hitting prospect. Golson has all of the baseball tools. Unfortunately, he has demonstrated few of the baseball skills the Phillies expected their former first round pick to develop, especially plate discipline. It is worth noting that the Rangers have shown a remarkable ability to turn disappointing outfield prospects into productive major leaguers the last few years. Golson's ability to play center field gives him a chance to make the Rangers as a reserve if they trade Marlon Byrd (OF, TEX) as rumored. Golson should be watched carefully in Spring Training. John Mayberry has gone backwards as a prospect. He has traded walks for a more aggressive approach at the plate, which has resulted in more homeruns but not much else of value. The Phillies do need a power hitting left fielder if Pat Burrell (OF, FA) leaves via free agency. This is a situation worth watching. If the Phillies are unable to sign a big name outfielder Mayberry could become a serious option. The Red Sox traded Coco Crisp (OF, KC) to the Royals for Ramon Ramirez (RHP, BOS). Ramirez is a good relief pitcher. If Ramirez improved his walk-rate (3.89 in 2008) he could be a potential closer. 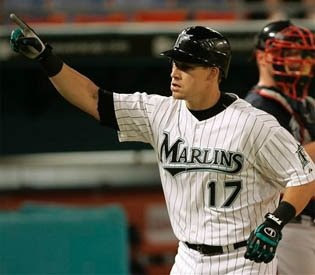 He has held opponents to a .235 batting average in his career and just .220 in 2008. He also collects about a strikeout per inning. The seventh and eight innings were a problem at times for the Red Sox last season, Ramirez shores that up nicely. Unfortunately, for fantasy owners, Ramirez is probably third or fourth in line for saves behind Jon Papelbon (RHP, BOS). Coco Crisp had some horrible luck while in Boston. He broke his wrist, suffered a separate hand injury amid a series of other minor but aggravating maladies, and lost his job to a much-hyped prospect. Here is an early Big Fat Claim: Coco Crisp will regain all of the power he seemed to lose as a Red Sox with the Royals. Barring any bad news, he will be coming into this season completely healthy, with a full time job for the first time in three years. The Oakland Athletics signed Chris Schroder (RHP, OAK) formerly of the Washington Nationals to a one-year contract. Schroder has little chance of making the major league team but Billy Beane sees something in him so this transaction is worth noting. What Beane sees is a mystery to me. He does not get groundballs, he walks too many batters, and he allows too many homeruns. Gasp! Perhaps Billy Beane signed a player based on his scouting report rather than his stats. Schroder was once considered a future closer by the Expos/Nationals. Nah, it couldn't be that. The St. Louis Cardinals signed free agent Ian Ostland (LHP, StL) to a minor league contract and invited him to Spring Training. Ostland had some fantastic indicators in the Tigers' minor league system. Because of his age, Ostland is not a prospect but his numbers are too good to ignore. Players like this become quality cheap relievers for smart teams. In 2008 is K/BB ratio was an impressive 4.53. His .319 BABIP indicates he was probably unlucky last season. The Cardinals are a great team for a guy like this. The Cards have a ton of uncertainty in their bullpen (including the closer role), LaDuncan has made a habit of turning older players and failed prospects into valuable parts and based on stats Ostland is as good as any of them. Owners in deep leagues must pay attention this spring. The Chicago Cubs re-signed starter Ryan Dempster (RHP, CHC) to a four-year, $52 million contract. Dempster may have gotten a little lucky in 2008 but there are no glaring flukes in his stats. He is a groundball pitcher that gets a little less than a strikeout per inning, which is the formula for a great starter. If his walk-rate goes back to normal and his HR/FB (which was a very low 7.7 percent) returns to his career average of 11.1 percent, we could see some regression but not enough to rob him of all his value. If I owned him, I would be holding him. The Baltimore Orioles signed Brad Hennessey (RHP, BAL) and Donnie Murphy (INF, BAL) to minor league contracts and invited them to Spring Training. Hennessey is a terrible pitcher. His pathetic K/9 is only slightly higher than his bloated walk-rate. In 2008, he even reversed his GB/FB trends and allowed significantly more fly balls than grounders. He allows too many homers. He is also moving to a far worse park and league for pitchers. Hennessey should not be a fantasy consideration. 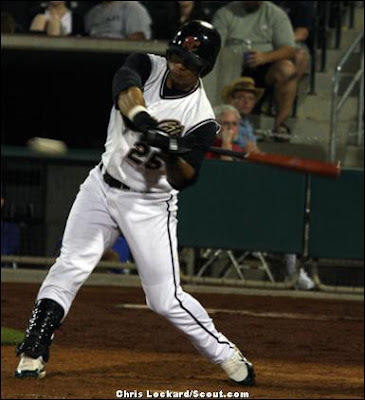 Donnie Murphy is a linedrive hitter considered a top prospect at times in his career. Unfortunately, he has never put together a season worthy of such a designation. His biggest problem is making good contact. He struck out almost 37 percent of the time during the 2008 season. His power is good but he does not hit enough flyballs to be a big homerun hitter. For the Orioles, Murphy is only an option as a utility player unless we see Brian Roberts (2B, BAL) traded. The San Francisco Giants signed Jeremy Affeldt (LHP, SF) to a two-year $8 million contract. Affeldt was a top prospect of the Kansas City Royals who failed as a starting pitcher. He seemed to be failing as a reliever too until something seemed to click for him last season with the Cincinnati Reds. His fastball velocity made a significant jump and his strikeout rate made a corresponding leap. His walk rate also improved significantly. Affeldt has always been an extreme groundball pitcher and was even more so in 2008. Now Affeldt is moving from the hitters' haven of Cincinnati to one of the league's better pitcher's parks in San Francisco. It also does not hurt that the Giants have been obsessed with defense the last few years. If Affeldt's improvements are real (and there is little to say they are not) he should excel for the San Francisco Giants in 2009. Fantasy owners in deep leagues should be paying very close attention. The Washington Nationals signed 1B/3B Matt Whitney (formerly of the Cleveland Indians) to a minor league contract and invited him to Spring Training. The Nationals selected Whitney in the Rule V draft in 2007 but had to return him to the Indians after a poor Spring Training, so they obviously like him. Whitney was a top batting prospect until he suffered a major leg injury in 2003. This cost him the next three seasons of his career so he lacks the at-bats you might expect a 25-year old minor leaguer to have collected after six years in the minors. In an attempt to take more walks and improve his on-base percentage, Whitney robbed himself of some power last season. However, he was successful at improving his walk-rate (11.3 percent) and if he can keep his gains and regain his power stroke he could be a stud in the making. The Nationals have some of the best talent evaluators in the game, and they believe he can do it. Whitney is someone to watch this spring. Who is the next Fantasy Baseball Stud? An early look at the biggest risers in fantasy baseball drafts. The 2008 season saw the rise of several young players. Which one is your favorite for fantasy baseball dominance? The St. Louis Cardinals signed free agent lefty Ian Ostland to a minor league contract and invited him to Spring Training. Ostland had some fantastic indicators in the Tigers’ minor league system. Because of his age, Ostland is not a prospect but his numbers are too good to ignore. Players like this become quality cheap relievers for smart teams. In 2008 is K/BB ratio was an impressive 4.53. His .319 BABIP indicates he was probably unlucky last season. The Cardinals are a great team for a guy like this. The Cards have a ton of uncertainty in their bullpen (including the closer role), LaDuncan has made a habit of turning older players and failed prospects into valuable parts and based on stats Ostland is as good as any of them. Owners in deep leagues must pay attention this spring. I blew up another computer last week and that's the reason for the sporadic posting. Hopefully I'll be back in prime blogging action tonight. For now you can satisfy your Jones for off season fantasy baseball articles by checking out my latest piece for RotoExperts.com, Hot Stove Junkie! This is not a great trade for the Rockies. Greg Smith does not strikeout batters (5.25 K/9) and does not have good control (4.11 BB/9). This is a mortal combination in the thin air of Colorado. He also allows tons of fly balls (45.5 percent) and very few grounders (34.2). Avoid Smith in your fantasy drafts, as if he was the plague. Huston Street is a competent reliever. However, he is another fly ball pitcher heading to Colorado. Street could retain competency due to his very good strikeout rate (9.07 K/9) but he will have to improve his platoon splits if he hopes to become their closer. Carlos Gonzalez has all the tools and scouts drool over his potential. What the Athletics found out is that it may be awhile before he actually becomes a solid major league player offensively. Fortunately, for fantasy owners, the thin air has a way of speeding up the development process when it comes to batters. Dave Cameron is one of the best baseball bloggers on the planet and he is up for a blogger scholarship. Let's help him get it! Vote Here! 1. A description of the dated strategy and how it was supposed to work. 2. The methods your opponent can use to disrupt the strategy. 3. An alternative way to re-shape the strategy to make it workable again. At the core of the strategy was one of the tenets of Advanced Fantasy Baseball - Draft skills, not roles. Using this strategy allowed you to draft the best pitchers in the game before they became the expensive closers and starters that so many owners were spending so much of their budgets to acquire. This plan was a huge smash and it quickly became all the rage in fantasy leagues, which is also when it became almost useless. With everyone chasing the same group of pitchers the untouted starters and middle relievers that were once atainable for $3-5 were now costing well into the double digits. Even owners who were not strictly using the strategy knew to bid up the owners utilizing the LIMA plan (which if you knew the plan was very easy to spot). Even Ron Shandler has moved on from using the LIMA plan. There are ways to make the LIMA play workable if you are determined to use a version of it. One very simple way is to increase the budget allocated to pitching to an amount that allows you to draft a nice collection of the better LIMA pitchers but not so much that it seriously diminishes your offense. Another method is to add an Ace Pitcher (one that meets the LIMA criteria of course) to the mix. Adding an ace will not only (in theory) increase your pitching points but it will also throw your competitors off the scent when it comes to guessing your strategy. This strategy has been around for almost as long as fantasy baseball has been played and there are several variations. The object of the strategy is to buy as many top tier stars as possible (both hitters and pitchers) until you only have one dollar left for each of your remaining roster spots. The idea is that a large collection of stars will carry your roster and that your scrubs give you the opportunity to get lucky. The strategy gets beat all hollow when your opponents bid up the better scrubs and leave you with the true dregs of the league. The strategy also requires you to get lucky with both the emergence of scrubs and the continued health of your stars. The tougher your league the more difficult it is to recover from the loss of your $40 stud hitter or $25 ace starter or closer. This is also a very dangerous strategy for the novice owner to use, especially in a league full of sharks. The plan can be salvaged by reserving enough of your budget to allocate $2-5 on those last few roster spots. Another variation is to buy just one stud per position. In other words one stud catcher, one stud corner, one stud infielder, a stud outfielder or two, an ace starter, and a top closer. If done carefully this can be done with plenty of money left to fill your other spots. This strategy attempts to do exactly what its name says it will. In this strategy the owner will spend no more than $30 on any player. This way the owner can afford to buy lots of talent and will not need to roster many (if any) scrubs. If used intelligently this plan ensures that the owner will have a deep, balanced roster. This protects the owner from injury problems and slumping superstars. The problem with this method is that it is very league dependent. Every league is different and some will pay different prices for certain types of players. Anyone who has ever opened a fantasy guide and scoffed at the idea of players being bought for mid-teen prices when in your league these guys go for $25-30 already know the problem. If mid-tier guys are selling for $25-30, then the true superstuds are going for just $35-40. Thus cutting off your bidding at $30 also cuts you off from all of the best quality talent. You can use a version of this plan if you are very familiar with the spending habits of your fellow owners and you are confident in your ability to adjust your spending on the fly. The important thing is to getyour fair share of the available talent. By sacrificing a roto category such as saves or steals, the owner hopes to use the money budgeted to those categories to dominate the other ones. In the vast majority of cases the owner chooses saves, because closers are often overpriced contribute to fewer categories than starters and middle relievers. This strategy often fails because the owners who utilize it dump the category during the draft and fail to collect enough points in the other categories to win their leagues, though it is very good at placing owners within striking distance. Making punting a useful strategy is very simple. Rather than dump a category for the entire season, just dump it at the draft. After the draft the owner should use every available resource to find the stats he ignored during the draft. By constantly monitoring the waiver wire and taking advantage of trade opportunities its possible to do quite well in the neglected category and thus have a shot at winning the league. A very common strategy in fantasy baseball drafts is too ignore the more expensive catchers in favor of drafting two $1 catchers (or waiting until the end of the draft) that receive very few at-bats. The idea behind the strategy is that so few catchers are productive (and usually even the productive ones do not compare to the comparably priced outfielders or corner infielders) that the money it takes to buy the very best at the position is better spent on more productive players at other positions. And further that with not enough catchers to go around very few of the other teams would have strong catching anyway. While it sounds okay, essentially dumping the catching positions, it creates two holes in your fantasy lineup. The owner with strong hitting from the catcher spots has an offensive advantage that can often make a huge difference in the final standings. Very carefully scouting catchers can usually uncover productive catchers for bargain prices. last season Ryan Doumit and Kelly Shoppach were draft day bargains that carefully scouting may have revealed. This season Jesus Flores and Pablo Sandoval may be huge bargains at the catcher position. MLB always puts added focus on weak positions which ensures that eventually the development cycle will result in a better crop of catchers. NEXT: On Sunday read why Buying Low and Selling High is not as simple as it sounds. Advanced Fantasy Baseball will be drafting from the eighth spot in the American League Fantasy Sports Invitational Challenge. Here is the whole draft order with the other competitors listed. I'm glad to see that there are some great sites competing. We all know how boring it get when the competition is not up to the challenge. Check out my RotoExperts.com blog for the fantasy spin on Nick Swisher joining the New York Yankees. Yesterday, center fielder and first baseman Nick Swisher and minor league pitcher Kanekoa Texeira was traded from the Chicago White Sox to the New York Yankees for utility infielder Wilson Betemit, and minor league pitchers Jeff Marquez and Jhonny Nunez. Check in late tonight (maybe the morning) for a article on Fantasy Baseball Strategies.